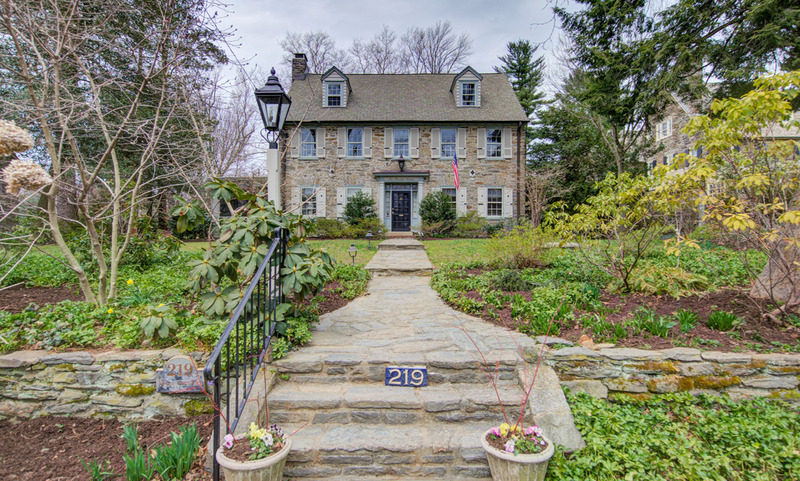 Curb appeal abounds in this center hall stone colonial, on a tree-lined street in a fantastic walk-to-everything location in the heart of Chestnut Hill. This exceptional home is set back on a deep lot with mature landscaping, off-street parking and two car garage. A charming stone path leads to the front door and center entrance hall. The large formal living room has deep windowsills and built-ins, and a fireplace that’s flanked on either side by French doors that lead to the gracious screened-in porch with slate floors. The sunlit dining room with deep windowsills leads to the gourmet kitchen with gorgeous custom cabinetry, granite countertops, Thermador oven/range, Sub-Zero fridge, Bosch dishwasher, under counter wine fridge and window overlooking the side yard. The kitchen opens to the rear family room with walls of windows looking out on the extensively landscaped backyard, ample built-in shelving with window seat, and doors to the side porch. An updated powder room off the center hall offers marble floors and pretty glass tile backsplash. The second floor private master bedroom suite offers tons of windows overlooking the yard, a large walk-in closet, and master bath with oversized shower and lovely custom double vanity. Lovely princess suite with totally renovated full bath, walk-in closet and convenient laundry room. A third bedroom suite with full bath completes the second floor. The third floor features 2 bedrooms and full bath with large clawfoot soaking tub. The real treat of this property are the extensive stone paths, mature trees and landscaping, quaint English garden with raised garden beds – perfect for a vegetable or flower garden, multiple patios and firepit area. A garden shed and 2-car garage in the back of the property are accessed from Meade Street. Sit on the side porch or on the rear terrace with family and friends and listen to the summer concert series at Pastorius Park, just a short stroll away! Truly a wonderful, central location close to Highland Train Station and everything Chestnut Hill has to offer. Don't miss this opportunity!